The second iRacing Endurance event of 2018, the 12 Hours of Bathurst, set on Mount Panorama Circuit in Australia, with two classes featured in the event: Mercedes AMG, Audi R8, BMW Z4, Ferrari 488 and McLaren MP4-12C forming the GT3 class and the Porsche 911 GT3 Cup the second slower class. Hellenic Racing was attending with three line-ups. 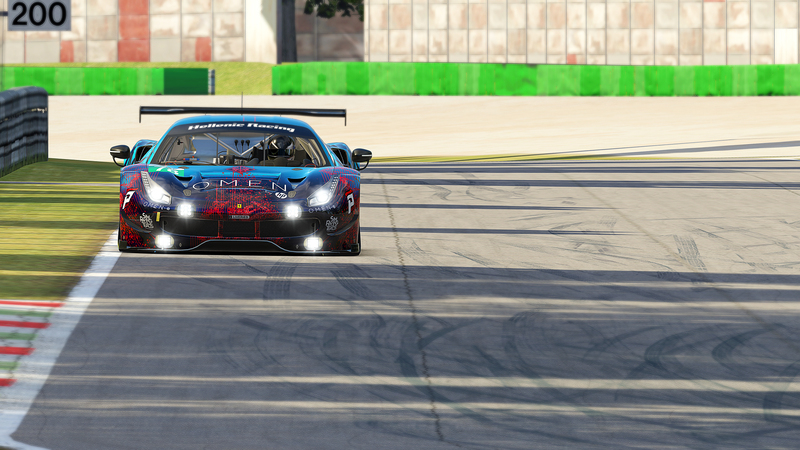 Racing in the second split our Mercedes AMG GT3 with Nestoras Kiosoglou, Bill Kazantzas and George Zervas, Hellenic Racing RED in the third split with the choice of the Ferrari 488 with Andy Perrs, George Alamaras, Nick Koudourakis and Giannis Chourdakis and last but not least Hellenic Racing BLUE with the Porsche Cup car racing in fourth split with Konstantinos Giagias, Lucas Tzivelekis and Pavlos Vezirtzoglou. Our AMG entry with a qual time of 2.01.350 started from P12. Nestoras was behind the wheel with the first goal to not damage the car in the close walls of the mountain. With the green flag, all cars played it safe and formed a big line of cars. Nestoras kept the pace and stayed close to the cars in front. But the mountain “takes no prisoners” and after many cars having problems with crashes in the walls after 1 hour and after the first pit-stop, saw the car climbing into sixth place. Nestoras kept going for two more stints and a total of 90 laps before handing it over the car to George in second place. 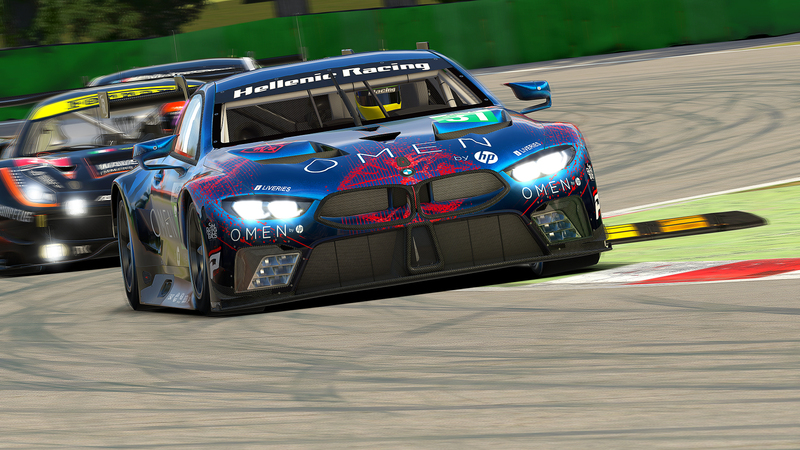 George maintaining a good pace keeping the car in second place despite the hunt by the more experience MSP Phoenix Racing PRO driver Reto Hartmann. In his second stint, George had a contact with a slow and out of control Porsche car in the final turn of the circuit making minor damage to the car’s aero, losing 2-3kmh in the long straights. After a double stint, it was time for Nestoras to get back to the car, running in 5th place. After 4 stints and a different tire strategy, we were back in the podium places and it was time for Bill to get in the car. Bill did what he does best, take everything out of the car, making fast laps and closing the gap from the cars in front. In Lap 262 he was in 4th place and catching the car in front, MOMO Australia TTR with Emily Jones in the wheel. For the rest of his stint he just stayed behind saving as much fuel as possible. Two last hours and last two stints and it was time for Nestoras to take the wheel again in fourth place. The gaps in front are big but with all teams having different strategies, the podium was still in our mind. Going in the last hour and final pit-stop. We doubled-stint our tires and TTR decide to tripled stint theirs. 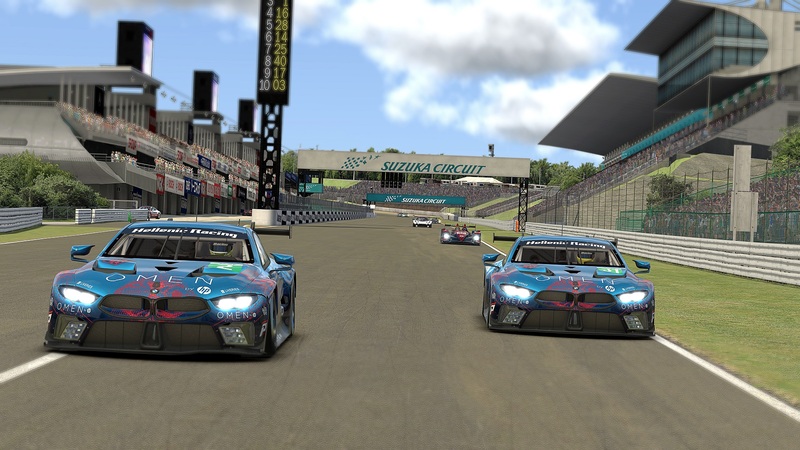 We were 25sec behind the second and third place, TTR and Inex, respectively. We hoped that their fight would be a time gain for us. We were faster at that point but was not enough with only 30minutes to go. But then they touched and lost lots of time. 25 seconds were down to sixteen. 26 minutes to go, about 13 laps, we were faster by 1-2 seconds per lap at that moment. We were closing. The pressure was on them. Ten minutes to go and Nestoras closed the gap to two seconds. The battle was on. Lap 337 Turn 1 Nestoras just behind the third-place Inex Ferrari car and driver Joe Letteriello, had a better exit, and in the Mountain straight made the move on him. Pass in Quarry turn and looking ahead for the second place car. Sam Blacklock of the TTR car was slow in the mountain due to his very old tires, but there was no place to pass there. In the penultimate lap, after 11 hours and 58 minutes, second third and fourth were separated by 6 tenths of a second, and heading for the Esses going downhill… yellow flag… a Porsche had spun in the middle of the road… TTR had no time to react and crashed into the 911 GT3 Cup car. Nestoras managed to pass through luckily and Inex car had to stop to avoid crashing into the Porsche. Then Nestoras just drove safely the last lap to bring the car to the second position. A big thanks to our sponsors.